So what’s new? I have done some readings, had a really great time at Feen Con in Bad Godesberg. I was at the FEST of Fantasy. There, too, I read from my stories. The FEST is always quite wonderful. Unfortunately, this year it was a bit rainy. A new book has just been published: an anthology of short stories, called “Funtastik” to which I contributed a story. 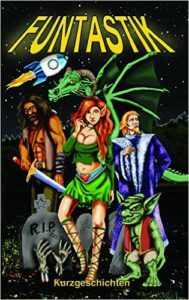 The aim of the anthology was to present the funny side of fantasy. The stories are quite varied. After all, we all have a different sense of humor. Another short story will appear soon. unfortunately I am not allowed to tell you any more details. Soon, I promise. 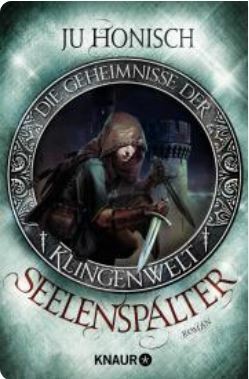 My new novel “Seelenspalter” (=Splitter of Souls) will come out in Droemer Knaur early next year. It has a really nice cover, do take a look. It will be the first of hopefully many books of my new series called “Klingenwelt” (Blade World) And what is it about? Seelenspalter can bei preordered here. Maleni is harmless. Taryah is deadly. Together, however, they are but one single person, trained, moulded and soul sliced by the Assassin Order of the Xyi. Without ever being seen, this order guides the fortunes of the war torn Eight Realms of Predorenn. Taryah is a courtesan and hired blade without a conscience. Maleni is a nice, young woman who, while running away from her last deed, meets Umbert and Elgor, both of them travelling blacksmiths. Their knowledge is ancient and magical. They have their very own plans with Maleni who does not suspect this. Maleni must now fight against bloodthirsty pursuers, against the best killers of Eight Realms and against her own inner fighter. 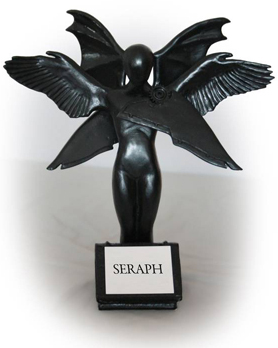 She cannot trust anyone, not even herself – and certainly not the mysterious fighter who shows up sometimes, only to disappear again into thin air. It’s time for: The LOVE scene. I can no longer put it off in the current book project. Somehow books can’t do without them. Love tends to be an integral part of the plot, at least in my books.Do I like writing love scenes? Not really. This is not because I have squeamish scruples, but rather has to do with the constant concern that one might stray from the extremely narrow path of good taste in favour of too blatant details on one hand or too flowery metaphors&similes on the other. So now hero and heroine are getting down to business. And right after that: pirates. By the way, I find many love scenes in books or movies quite unerotic. Again I do not think this is because of my prudishness, but sometimes you really want to close your eyes and complain: “Oh no, not like that!”. Did you ever notice that kissing noises in movies are always dubbed with the exact same squelchy smacking sound? All over the world, they are probably using this one single recording, a universal, DIN/CEN/ISO-certified squidgy slurp. 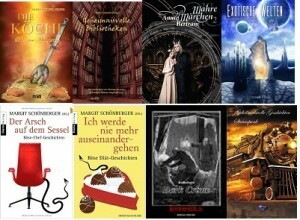 Patrick Süßmeier, a literary blogger who writes about speculative fiction, has asked a number of German SF/F authors about their “normal day”. A number of us already described their workday to him. I did – and so did Anja Bagus, Sandra Baumgärtner, Nadine d’Arachart, & Sarah Wedler, Markus Heitz, Ann-Kathrin Karschnick, Piper Marou, Henning Mützlitz, Nicole Schuhmacher. The list is stille growing. So if you’d like to know what the gory details of writing are about, you can find the answer here. I am probably better known for my rather longish novels. 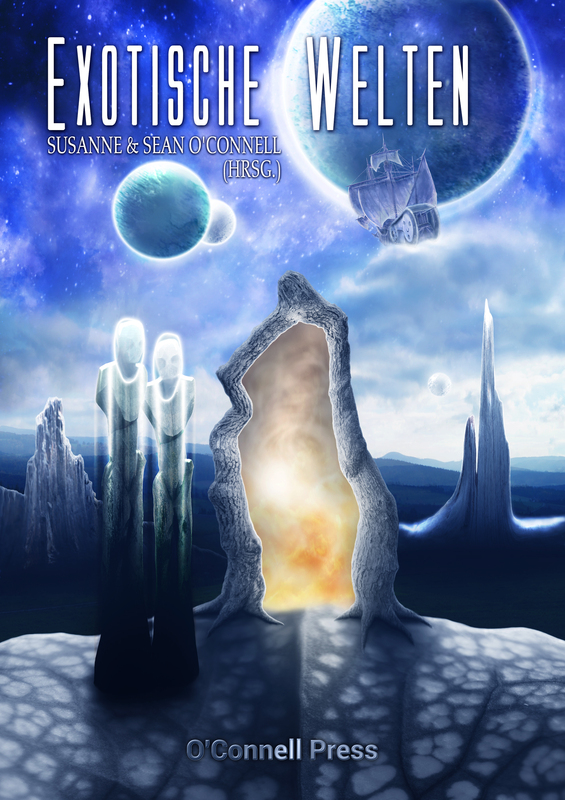 But over the year I wrote quite a lot of short fiction for anthologies. The list (please see below) may not even be quite complete. But if you read German, these are the places where you will find my stories. That last weekend I was busy writing. From morning to evening. And starting over after dinner right till Mr Sandman came by. I even had to decline a wonderful invitation to a a dear friend’s birthday party – no easy decision, believe me. But a deadline is a deadline, even if this particular deadline is a bit blurry, as I am still waiting for the contract. I certainly hope it will come soon, though. But just as musicians do not always know when and if there will be a next gig, and artists mostly cannot predict who will buy their the next picture – or when, writers, too, live in a sort of mire of uncertainty. This would, of course, be different for the very famous writers, musicians or fine artists. Once you have acquired a certain threshold of fame, you can hardly “create” your art fast enough to cover the demand. If, however, you are what a dear writer-colleague from Canada once called a “middling author”, then you just have to remember your knightly virtues and be patient. The good news: Soon there again a short story out by me – in an e-book with many other wonderful authors: “Exotic worlds”.